Denver Mayor Michael Hancock, center, joins other officials to cut the ribbon of a new protected bike lane, 2015. Photo: David Sachs, Streetsblog Denver. In one U.S. city after another, voters keep making their opinions clear. On Tuesday, the people of Denver became the latest to deliver overwhelming margins to a ballot measure that funded biking, transit, walking, pavement and traffic signal improvements citywide. Denverites voted 73 percent to 27 percent to back Measure 2A, a $431-million property tax package for “transportation and mobility” that is dedicated mostly to maintaining pavement and to reducing auto dependence — not expanding roadways. “We’re going to support the next generation of commuters who don’t necessarily think owning a car is the only way to go,” Mayor Michael Hancock, the measure’s top champion, had said during his State of the City speech in July. This post-recession trend was arguably kicked off by Seattle, which in 2015 sent a $930-million property tax levy to voters that was designed, in part, to support an unexpectedly large number of biking and walking projects. Despite a “no” campaign funded by a millionaire landlord and loud opposition from the Seattle Times, 56 percent of voters backed it. The trend became even clearer in 2016: Los Angeles County ($120 billion from sales taxes, 71 percent approval); Austin, Texas ($720 million from property taxes, 60 percent approval) and Atlanta ($260 million from sales taxes, 67 percent approval). All of those ballot measures had something in common: prominent line items for protected bike lanes as part of modern, low-stress biking networks. Seattle’s 2nd Avenue in 2009. Photo: Oran Viriyincy. 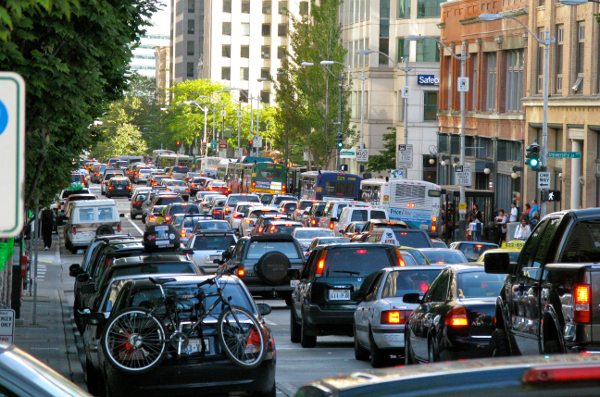 Indianapolis and Seattle also passed big transit-focused ballot measures last November. Tyler Frisbee, a former U.S. Congress staffer now working as policy manager for the Metro regional government in Portland, Oregon, said these trends — both “go big or go home” and greater emphasis on biking, walking and transit — are the natural result of less transportation funding flowing from Washington, D.C.. The Pfluger Bridge, Austin, Texas. For Laura Dierenfield, the active transportation program manager at the City of Austin, building the future means planning, designing and executing biking and sidewalk improvements at a blistering pace. Austin announced this week that it’s ahead of schedule on building out its citywide low-stress biking network but needs to triple the rate of improvements to spend all the money voters agreed to invest last year. Like the measure in Denver and elsewhere, Austin’s 2016 package included some money for widening roadways, too. But most of it — and most of the public messaging used to sell the package to voters — was about improving the roadways the city already had and using bus lanes and connected bike networks to make trips more space-efficient. It’s a message that seems to be spreading. Last summer Travis County, which manages the unincorporated areas surrounding Austin, put a $185-million bond measure of its own on the ballot, prominently including millions to construct bike paths and lanes along county roads and through county parkland. On Tuesday, 73 percent of county voters approved.